On Sunday, October 7th, the 2012 Beekeeping Class 101 gathered atop the mountains overlooking San Fernando Valley for our final beekeeping class of the season. Over the past 9 months we learned the foundations of beekeeping: equipment and protective clothing, safe placement of a hive, how to approach a hive, stages of life cycle within a colony, the social order of bees, general maintenance, how to treat diseases, parasites and problems that threaten the hive, how to feed the bees when nectar is low, and what to do if we come across an aggressive hive. We learned how to help the bees help themselves. We learned how to be responsible beekeepers in an urban environment. We learned the difference between bee 'keepers' and bee 'havers'. 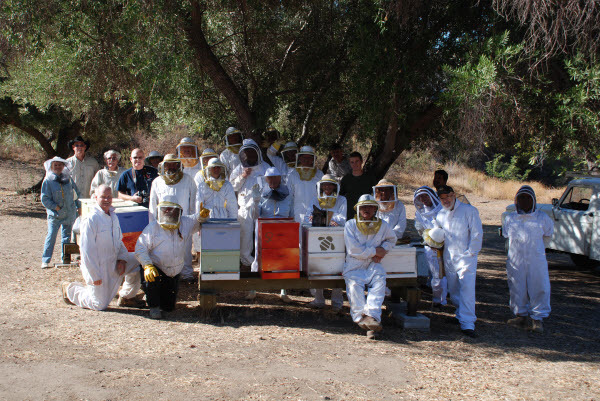 We would like to thank Bill Lewis (Bill's Bees) and Clyde Steese (Bill's Bees and LACBA President) for this wonderful class in beekeeping, for making their apiaries available to us, and for sharing their time, experience, and knowledge with us. We hope to see you in February 2013 for Beekeeping Class 101. Congratulations to all the new beekeepers!!! Bee Happy, Bee Well, Bee Alive!! !